If you are looking for a central cheap hotel in Vilnius Old Town location 2 star LITINTERP Guest House is one of the cheapest options. This is one of the longest - standing guesthouses in Vilnius, which has been providing inexpensive B & B accommodation since 1992. It is located on a quiet Bernardinu Street, but only a few minutes away from the main Pilies Street, right in the heart of the Old Town. They offer 4 single, 10 double / twin and 2 triple rooms. Each room has access to a small kitchen with a refrigerator and tea / coffee making equipment and also a telephone. 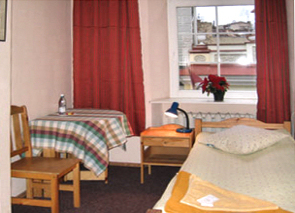 The rooms are decorated with original photographs of the Old Town and furniture made from Lithuanian wood. 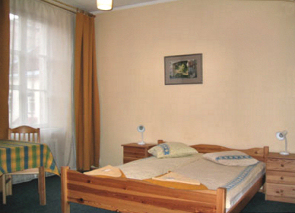 The rooms look quite basic, but clean and with somewhat homely traditional atmosphere. Some of the guestsrooms have private bathrooms, while others have shared bathrooms (a maximum of 3 - 4 guests share one bathroom). Services include car parking in the inner courtyard, airport pick-up and car rental can be arranged. Guests have their own keys with access to their rooms at any time. You are free to discuss your breakfast menu with the staff. Some rooms have shared bathrooms.